You don't always know when you are ready to take a break...a brief holiday...a respite from the everyday. Sometimes there are signs. You are tired and cranky....you dream of getting in the car and just going...and telling no one....and if you work with the public you just want to slap people. Which of course is not allowed (mind you there should be exceptions - especially school holidays). I got to the stage if I had to tell another child to 'GET DOWN FROM THERE, IT IS A BOOK SHELF NOT A JUNGLE GYM' I would have screamed. off to the civilised wilds of South Australia. 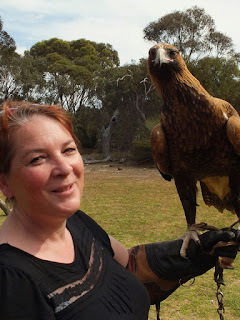 Firstly to Robe (such a lovely place) then on to Victor Harbour - then catching the ferry across to Kangaroo Island. What an idyllic relaxing place. We stayed in a cottage ...with no wifi, no telephone reception. Nada. There was a television (with limited channels- gotta love some of those Alice Springs adverts) but an abundance of wildlife. Each day we got to watch the kangaroos come out to graze, we watched the swallows impersonate pegs on our small washing line. We watched ducks fly away each time we neared them on the lagoon...identified a Nankeen Kestrel and chatted to a few echidnas. Time to move on, so we headed to Adelaide and the lovely Clare Valley and perhaps a winery...or two. Did revisit a few places that we had taken our children to years and years ago- but they had changed dramatically. Or perhaps we were viewing them as adults, not as adults with excited young children? A final destination was Halls Gap for a couple of nights. Some nice walks, more animals...well kangaroos in abundance.....not to mention the valley of cairns. It was a wonderful break. I read...read a lot. Three novels and one verse novel. Usually I don't read during the day time- I feel guilty. There is so much more to do....house work, real work, gardening, writing. But on holiday you feel obliged to read. So read I did. Surprisingly enough I did write. Whenever we go away I keep a very basic travel diary of sorts- usually where we stayed, what we did, brief caption of what I thought the place was like etc etc. Very minimal. And I was not going to pressure myself to write- I was simply going to be. To unwind. And before I knew it, a short story and quite a few poems appeared. It wasn't a lot of work achieved but then I didn't start out to take a break and write. I wanted a break to do nothing. (which of course NEVER happens). To re-energise myself after the hectic school holidays - to simply remember how to breathe. And I did...but can I share the highlight of the trip? 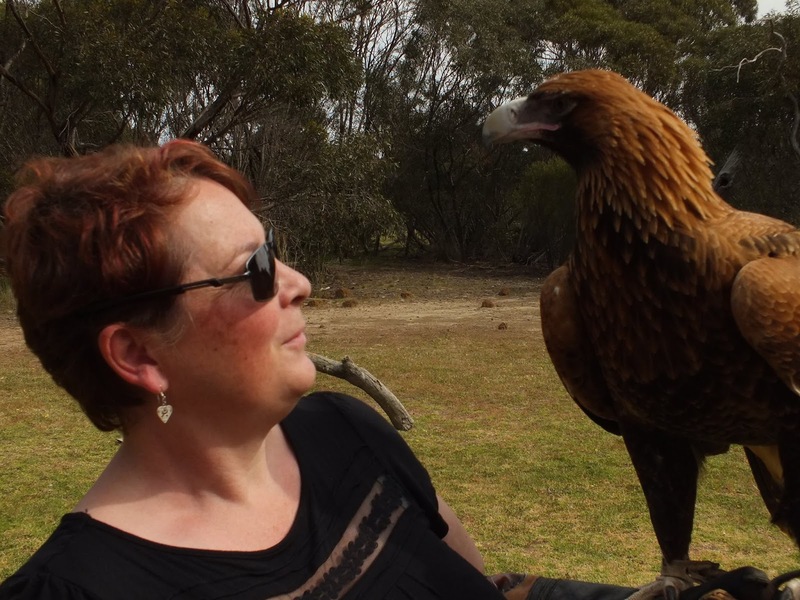 Having the chance to hold a wedge tailed eagle. and hopefully the writing will flow.